Last February, we presented the first in a series of essays looking back and celebrating 10 years of history and accomplishments of the ABDSP Botany Society. That article reported on the goals of the Society and the activities put in place in the first year to achieve them. This second retrospective will focus on two parts of our mission: education through field work and building a scientifically useful herbarium. There is no better way to learn about plants than to see them in their native habitat, watching them germinate, grow, flower and fruit. Throughout our 10-year history, a high priority for new and seasoned Botany Society members is to do just that. 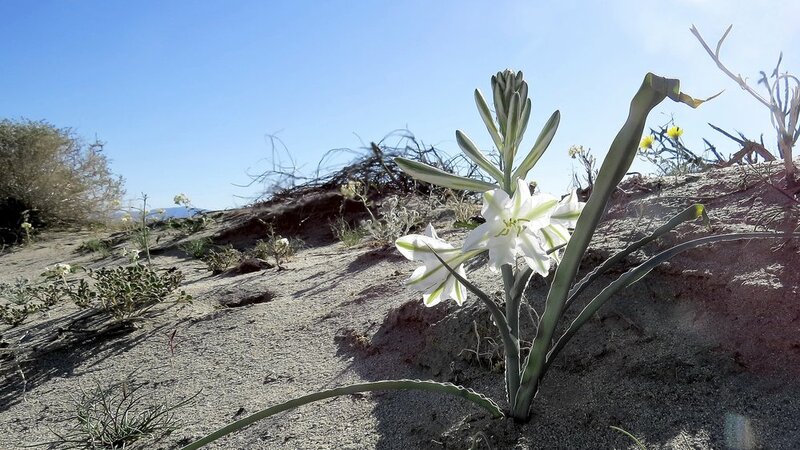 San Diego County contains one of the most diverse flora on the continent, and ABDSP encompasses many plant habitats ranging from the desert floor to the montane, offering rich opportunities to learn. Here are a few of the Botany Society’s accomplishments in field work. In the first year of the Botany Society, volunteers became trained participants of the San Diego Plant Atlas project of the San Diego Natural History Museum (the NAT). The Plant Atlas aims to describe all native and naturalized plants in the County. This information documents our region's unique natural history and biodiversity, and provides valuable scientific data showing how it is evolving. These trained volunteers routinely survey one or more sectors within the Park (3 x 3 mile squares) and collect plants not only for the NAT herbarium but also for our CDD herbarium. The goal is to collect a representative of each plant that exists in that sector. Many hundreds of plant specimens have been collected; one is sent to the NAT for identification and another is entered into the CDD herbarium. Even though the Plant Atlas Project is coming to an end, many Botany Society members still monitor their sectors. Most notable of them is Mary Jo Churchwell, who logs in many hundreds of hours each year monitoring several sectors. The Botany Certification Course held every year heavily relies on field trips for educating new Botany Society members. Our theme might well be summarized by the questions: What do you see? What else do you see? The field trips led by botanists Kate Harper and Larry Hendrickson are the most popular classes. Not only are they fun, they are scientifically valuable. On one of the very first field trips in the first year of the Society, Diana Lindsey found a species in the Clark Dry Lake Area that was new to the Park: Eriastrum sparsiflorum subspecies Harwoodii (according to Sarah Degroot). Botany Volunteer Pat Matthews is our weed warrior. For many years now, Pat has led a group of volunteers dedicated to eradicating the two worst invasive plants in the Valley: Sahara Mustard (Brassica tournefortii) and Volutaria. An invasive plant is one which outcompetes native plants, thereby altering the composition of plant communities and, often, leading to the eradication of native plants. The scientific, economic and even cultural benefits of this field work are enormous. The CDD has an herbarium—the collection of the plants that exist within the CDD parks. Our Herbarium is part of a network of herbaria designed to share information about the flora of the region. Botany Society members have contributed to the Herbarium in many ways. First, they collect (using proper protocols) representative plants in the field. Second, they process the plants for preservation: drying, debugging (put in a freezer – really!) and then mounting (gluing) them onto sheets. The sheets show whole plants (if possible), their parts, their provenance, their identification and when and who found it. Over the past 10 years, thousands of hours have been spent by Botany. Society volunteers mounting specimens in the Botany Lab: Kathy Bussey, Laura Webb, Ruth Ehly, Ruth Otis, Heidi Addison, Sonja MacGrath, Martha Ellul, Mary Jo Churchwell and Claire Burwell are among those on the “mounting” team. Volunteers even built the workbenches! Third, volunteers enter the scientific data (what it is and where it was found) into the CDD data bank so that it can be used by scientists. A major accomplishment of Botany Society volunteer Birgit Knorr, aided by data base expert Linda Gilbert on loan from the Paleo Society, has been to create a useful database and to enter and update the records describing the flora of our Park....more than 5500 different plants. This has been an enormous undertaking! To say that field work is the foundation of the work of the Botany Society (indeed, of all our Societies) may be an understatement. To be effective in the field, Botany Society volunteers must learn plant morphology, plant ecology and the characteristics of the plant families comprising the diverse plant communities that exist in our Park … that will be the topic of the next installment describing our first 10 years. On Friday, December 14th, Pam's Amble explored the wash leading to Truckhaven Rocks. Amblers were richly rewarded! Right by the road we were greeted by glowing pink desert sand verbena (Abronia villosa). Then, not only were the usual suspects--lavender (Hyptis emoryi), creosote (Larrea tridentata), and burro bush (Ambrosia dumosa)--in bloom, but indigo bushes vied to paint the wash, well, more indigo, and a rush milkweed (Asclepias subulata) sported cream-colored blossoms. On a smaller scale, we also saw blooming wishbone bushes (Mirabilis bigelovii), brown-eyed evening primroses (Chylismia claviformis), and even one each of an eye-popping yellow poppy (probably Eschscholzia californica, given the size of the unfurling bud) and more demure ground cherry (Physalis crassifolia). Also exciting were the vast number of healthy lupine seedlings--the wash should be awash with blue-purple in the not too distant future. In mid-October monsoonal rain fell in two distinct locations in the Anza-Borrego Desert. One area was the Borrego Badlands. The other was along S-2 between Whale Peak and the Mountain Palm Spring area. Both areas received about 1. 5 inches in one day, and both now have lots of germination of annuals and even some flowering. Botany Society members have recently hiked both of these areas to see what's coming up. In the badlands the ocotillo (Fouquieria splendors) leafed out extravagantly. Many desert lilies (Hesperocallis undulata) are also showing their leaves. A couple of them were even in bloom, which is remarkable for December. A few hairy desert-sunflowers (Gerea canescens) have opened up. Most remarkable was the number of barrel cactus (Ferocactus cylindraceus) with buds and flowers. Emerging annuals include Arizona lupine (Lupinus arizonicus), Thomas' buckwheat (Eriogonum thomasii), and California caltrop (Kallstroemia californica). The caltrop is a monsoonal annual that only comes up in response to summer or early fall rainstorms. Dune evening primrose (Oenothera deltoides) is just starting to bloom. Perhaps the most uncommon plant we saw in bloom was Long-beak streptanthella (Streptanthella longirostris), a dune inhabitant. The south end of the park was equally florific. The most frequently seen plant was Brown-eyed primrose (Chylismia claviformis peirsonii) which is blooming by the thousands in June Wash. Devil's Claw (Proboscidea althaeifolia), another monsoonal annual, was abundant in Canyon 41 and Canebrake Canyon. It had both flowers and fruit in early December. Indigo Bushes (Psorothamnus schottii) were covered with deep blue flowers especially in the late afternoon. A few Orcutt's woody asters (Xylorhiza orcuttii) were seen in June Wash, but not yet in flower. The most unusual and surprising find in this area was a hybrid brittle bush, a cross between Encelia farinosa and Encelia frutescens. At at distance the plant appears to be a normal brittle bush, but closer examination reveals that the leaves and flowers are somewhere between the two parents. Three of these hybrid plants were observed in June Wash. The bottom line is that there are plenty of plants to see if one goes to the places where rain has fallen. However, the condition of plants changes rapidly with the weather, so don't delay. Get out there and see what's blooming. Note: Image links are to images on the iNaturalist Web site posted by Don Rideout. Jim Dice, Reserve Manager, UCI Steele/Burnand Anza-Borrego Desert Research Center, will be the January speaker as part of the Botany Society’s Public Lecture Series. He will discuss History of Botanical Research in Borrego on Monday, January 14, 2019. Jim Dice has been Reserve Manager since the Steele/Burnand Anza-Borrego Desert Research Center opened in 2012. He retired in 2012 from California State Parks after 25 years of service with the State of California. He served as manager for San Diego State University’s Santa Margarita Ecological Reserve from 1987-88 and was Curator of the Desert Garden at Huntington Botanical Gardens in San Marino, California, from 1981-1985. Jim obtained a B.S. in Botany from San Diego State University (1981) and an M.S. degree in Biology (Systematics and Evolutionary Biology) from San Diego State University (1988). Cost: Free; public is invited. The Anza Borrego Desert Botany Society is fortunate to have 2 gifted speakers for our monthly lecture series this coming Monday (Dec 10) at 10 a.m.
Our first speaker is Kate Harper, known familiarly as Botany Woman. Kate has been a botanist in the Borrego area for years and is a principal contributor of Tom Chester’s excellent Web site, Plant Species of the Borrego Desert. Following Kate’s talk will be Dr. Chris McDonald, Natural Resource Advisor for southeastern California. Chris will discuss plants that jeopardize desert native plants. McDonald is an expert in invasive plants and will demonstrate how to recognize aggressive, invasive plants in the Borrego Desert and discuss what can be done to control them. Dr Chris McDonald is the Inland and Desert Natural Resources Advisor for the University of California Cooperative Extension. His expertise is in managing plants in wildlands with an emphasis on managing difficult weeds.